To mark the 20th Anniversary of NBA Live, we’re posting content for every game in the series, including retrospectives, patches, countdowns, and more. 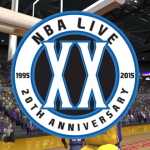 Whether you’re a long-time basketball gamer who grew up with the NBA Live series and would like to take a drip down memory lane, or you’ve only recently started playing basketball games and would like to learn a little about what they used to be like, we hope that you enjoy the 20th Anniversary of NBA Live content here on the NLSC! NBA Live 2003 is neither one of my all-time favourites, nor one of the best games in the NBA Live series. It is, however, a very significant game in the series for a few reasons; some good, some bad. In certain aspects, it made some very important steps forward that ultimately benefitted the series, even to this day. At the same time, it made several missteps, providing a clear lesson in what not to do with a five-on-five, sim-oriented basketball title that most gamers wanted to be as realistic as possible. Having said all that, let’s take a look back at NBA Live 2003. First of all, let’s talk about the big feature in NBA Live 2003 that was ultimately a step in the right direction: Freestyle Control. Yes, NBA Live 2003 was the first game in the NBA Live series to add dribbling controls on the right stick, which finally gave us full control over the moves we wanted to perform. Of course, for PC gamers, that change meant investing in a dual analog gamepad, or trying to make the most of the limited set of Freestyle Control moves that could be performed using the keyboard. A dual analog gamepad was therefore highly recommended, to take full advantage of the new dribbling controls. Freestyle Control was a big deal at the time, and I would go so far as to suggest it was a revolutionary innovation in basketball video games. For a start, it actually made use of the right stick, and did so in a way that gave us much needed extra control over players. From choosing the dribbling move we wanted to perform, to deciding whether to attempt a steal with the left or right hand, it was a big step up from what we had to work with in previous games. If there’s one thing that NBA Live has done consistently well over the years, it’s been its approach to player control, and the use of the right stick. NBA Elite 11 is an exception, but talk about that when we get there. If there’s a problem with Freestyle Control in NBA Live 2003, it’s that it’s a bit too powerful. The leads us into the main problem with the game overall: it’s just not realistic enough. Throughout these retrospectives so far, I’ve made a point of mentioning that older basketball games need to be looked at in context. What seemed advanced and realistic back in the day, now often seems primitive and not quite “sim”. That’s why it’s important to note that even at the time, NBA Live 2003 was not as realistic as most of us were hoping it would be, and even affording it some leeway due to its vintage, it hasn’t aged very well when you play it today. To begin with, the pace is way too quick. The speed at which players get up and down the floor actually gives the NBA Jam series a run for its money. If you’re playing on twelve minute quarters, scores are going to be in the 120-150 range on a regular basis. Shooting percentages are too high, and if you’re playing on All-Star or Superstar difficulty, you’ll find that you’re pretty helpless on defense. Freestyle Control added the “hands-up” move that you can still perform in today’s games, but it rarely made a difference; blocking shots was more effective. However, CPU players moved a little quicker, and often got to the hoop for a dunk or layup before you could react. The CPU is also very adept at picking off passes. On the harder difficulty levels, their ability to play the passing lanes is downright unfair, so expect to rack up a lot of turnovers as they put up some record-setting steal numbers. You’re not really rewarded for trying to play realistic basketball; in fact, that’s just asking to be blown out. Games are basically a shootout, so winning involves making as many shots as you can in between the occasional defensive stop to try and build the lead. You can call plays, your teammates will try to get into position, and the AI will also employ strategies such as running pick and rolls, but the sim elements are pretty shallow. Another arcade-like aspect of NBA Live 2003 is shotblocking. Basically every block in the game is a huge swat, and I mean, a huge swat. Most blocks will send the ball flying out of bounds, or rocketing down to the opposite end of the floor. Rather than a realistic sound effect of a hand slapping on Spalding, blocks are instead accompanied by a big booming sound. Similarly, the sound effect on dunks sounds more like someone banging garbage bin lids than a breakaway rim. Issues like that may not be as significant as the gameplay quirks, but they do little to cultivate a true-to-life atmosphere. Speaking of NBA Live 2003’s atmosphere, one of my biggest gripes are the “courtside comedy” cutscenes. I’ve mentioned these in previous columns, so if you’ve read those articles (such as this Wayback Wednesday feature) or played NBA Live 2003 back in the day, chances are you knew this was coming. In short, the game included a lot of goofy moments. Players messing around with the cameraman on the sidelines, pulling pranks on the coach by stealing his seat, tapping the referee on the shoulder and stealing the ball before tip-off, and a player stopping to sign an autograph at halftime – much to the annoyance of the head coach – are all examples of such cutscenes. In all fairness, there is a certain corny charm about them. If nothing else, we can look back on them and have a bit of a chuckle. However, they were just too absurd and silly for most of us simheads to enjoy. They were also set to utilise the players at certain positions in the lineup or bench order, so the antics of the cutscenes didn’t always match the personalities of the players involved. 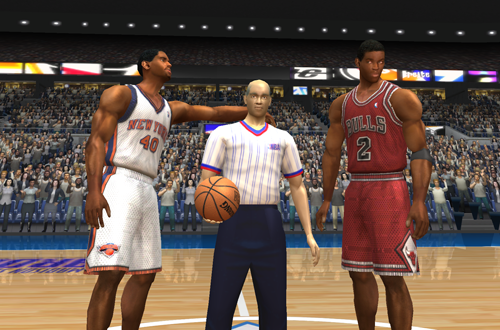 For example, one cutscene involves the centre chewing out the small forward for not paying attention during a timeout. It’s quite a sight when Kwame Brown scolds Michael Jordan during a game featuring the Washington Wizards! I should note that apart from those elements of the presentation, NBA Live 2003 actually does look very good for a game released in 2002. Its graphics are quite crisp and clear, especially in the PC version, and there are some quality player faces. They don’t exactly compare to the standard of today’s faces, of course, but I would say that they’re significantly better than the faces in NBA Live 2002. NBA Live 2003 is also the first game in the series to feature real head coaches on the sidelines. Suffice to say, there was a lot of attention to detail, and the game still looks pretty good on PC. 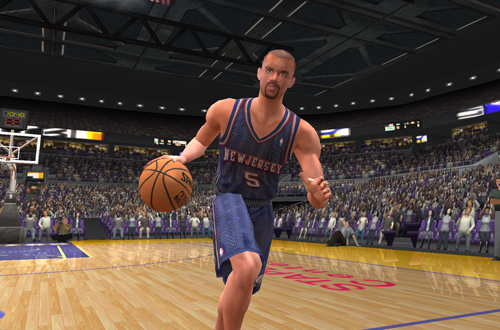 To its credit, NBA Live 2003 also included a couple of other features and functions that became a staple of the NBA Live series. It was the first game in the series in which users could select the jerseys they wanted a team to wear before games, and these included a few retro jerseys. The selection was a lot smaller than it is in today’s games, but Hardwood Classics Nights weren’t as popular back in 2003, and teams tended to only have the one secondary uniform anyway. We could also finally add jerseys to the game through DBF editing, instead of having to overwrite and swap files when we wanted to add and switch jerseys. Speaking of patching, NBA Live 2003 introduced a system that would make customising the game a lot easier for the rest of the series’ run on PC. Although previous games in the series could utilise special folders to load custom files, the new CustomArt system was deeper, and much better organised. EA even quietly provided us with a Customisation Guide, which gave us a heads up on the file structure, and instructions on where to place custom files so that they’d be loaded properly. With this method of installing patches, our patching community thrived for the next few years. 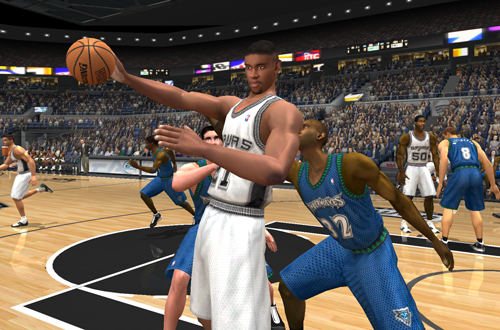 Getting back to gameplay, NBA Live 2003 did feature a few noteworthy fixes and enhancements. The offensive rebounding ratio was fixed, so more often than not, defensive rebounds far outnumber offensive boards. It’s also possible to break out of dribbling animations, so if you’re heading out of bounds or back across the halfcourt line with a spin or crossover, you can avoid the turnover with a pass. The controls are far more responsive than in NBA Live 2001 and NBA Live 2002, and feel pretty smooth overall. There are also some cool new animations, including a free throw line dunk that only a few players (such as Legend Michael Jordan) could perform. Collisions still had a lot of room for improvement though, which contributed to the aforementioned inflated number of steals. A Take Charge button was added, though it could be abused to keep the CPU in check. I once held Shaq to just six points, thanks to some well-timed flopping. Freestyle moves were overpowered, and there’s an also an exploit where performing a step-back greatly increases the odds of making a jumpshot. That should be the case, as the move creates space between your player and the defender, but it’s overpowered to the point where it can be used to knock down threes with players who shouldn’t be hitting them. It’s most effective on Rookie, but it can still be exploited on the harder difficulty levels too. In terms of the game modes, NBA Live 2003 featured a solid lineup to keep gamers occupied – exhibition, single season, Playoffs, Franchise, practice, and one-on-one – but by that point, they were all feeling very familiar. The PC version once again extended Franchise Mode back out to twenty-five seasons, and there was a little bit of tinkering under the hood with the mode’s AI, but apart from that, it was largely unchanged. The modes were fun enough, as long as you enjoyed the gameplay. That’s the rub, though: for the reasons I’ve outlined above, that wasn’t always feasible. 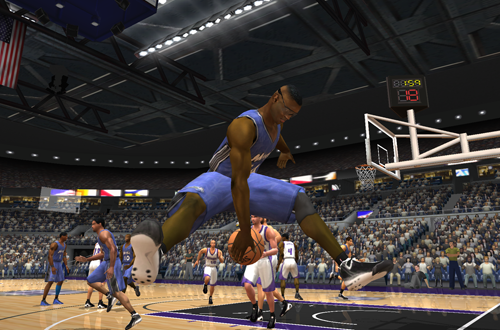 I should note that I did have some fun with NBA Live 2003 back in the day. However, I think a lot of that was making the best of the situation, and trying to accept the game for what it was. I did have a Franchise game going with the Minnesota Timberwolves that ran for about half a season, but I ended up losing interest in it. At the time, I was probably willing to accept some breaks from reality in terms of the gameplay, but NBA Live 2003 simply strayed too far from the simulation basketball game that most of us wanted. If you want to enjoy the game, then you need to accept it for what it is, and just embrace its style of gameplay. With that in mind, NBA Live 2003 is a curious deviation from what previous NBA Live games had tried to be. Even though previous releases didn’t always achieve the results we were hoping for in terms of realism, they were still geared towards it. It seems that the development team wanted to inject some fun into NBA Live 2003, with the silly cutscenes, quick pace, and high scoring. Unfortunately, in doing so, they misjudged what most basketball gamers considered to be fun, and what they wanted out of the NBA Live brand. Looking back on it now, NBA Live 2003 was an interesting mix of good ideas, bad ideas, and a vision that just didn’t gel with what the fanbase wanted. It introduced a revolutionary control scheme, but strayed too far from realistic gameplay. It featured ridiculous cutscenes, yet in other ways, boasted enhanced visuals and atmosphere. It has a lot of drawbacks, but it’s not without its merits. It’s interesting to revisit, but I can’t spend a lot of time with it. In short, NBA Live 2003 just wasn’t the game that most of us wanted and were hoping it would be. 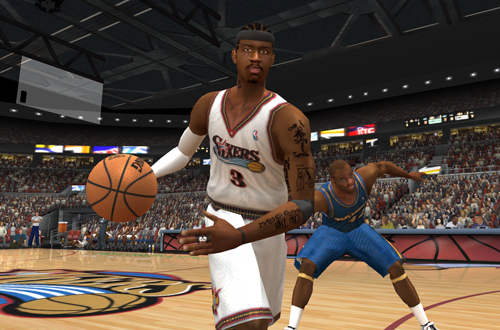 Fortunately, things would get a lot better in NBA Live 2004. Whoa, this was the very first NBA game I played on the PC. Had so many cherished memories with it, both when I was a Laker fan (my first “team”) and when I switched in favor of the Pistons (you could say I was a “bandwagoner” that time). You could play against the likes of rookie Yao, Shaq-Kobe, prime Duncan, prime Garnett, old Jordan and legend Jordan. I remember creating virtual players for my classmates and putting them in their favorite teams like Garnett’s Timberwolves and the prime Webber Kings. Blocks were like volleyball spikes, take charge was the answer to post players, and their rap soundtrack oozed with urban atmosphere. All that being said, the game hasn’t really aged well. Gameplay feels so barebones compared to the 2K games, music hasn’t aged well, and scoring was so unrealistically easy and fast that I found it hard to keep the pacing lifelike. Pros and cons aside, this game truly made its mark on me. Nothing will ever be like my first love in basketball PC gaming, which is: NBA Live 2003. Even though it doesn’t hold up as one of my favourites, I do have some nostalgia for NBA Live 2003, for sure. Freestyle Control alone makes it a pretty significant game in the series, and basketball gaming history in general. This was the very first NBA game I’ve ever played. I enjoyed it back then, as a little kid. Now it feels like bare-bones. I kind of liked the cutscenes at the time though. Or maybe it was just because I was new to NBA games. It definitely wasn’t all bad. It just wasn’t what a lot of simheads wanted, and certain things definitely haven’t aged well.